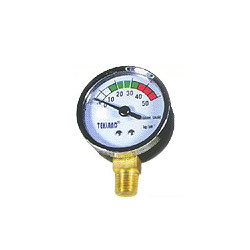 Manufacturer of Pressure Gauge,Thermometer & Steel Balls. 1. So designed to stand pulsation pressure and vibration, for proper use by atomizers. 2. Includes two models: SP-A model and SP-SA model. 1. Diameter: 2". 2. Pressure range: 0 ~ 50 kg/cm2. 3. Connection: 1/4" NPT or PT. 4. Material: (1) SP-A model: plastic case. (2) SP-SA model: SUS304 case. 5. Accuracy: +/- 1.5%.